Polaris Industries Inc. (NYSE: PII), the leading manufacturer of off-road vehicles, today announced the company is donating four utility off-road vehicles to The Salvation Army. 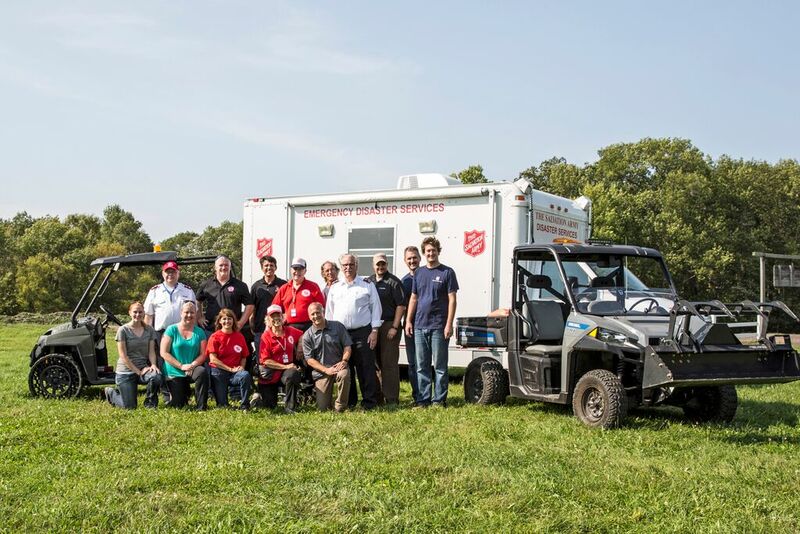 The donation includes a combination of RANGER®, HIPPO®, Polaris® BRUTUS® and Polaris® M1400™ vehicles, a variety of front attachments, and a set of TERRAINARMOR™ Non-Pneumatic Tires (NPT) to enhance The Salvation Army’s ability to assist in natural disaster clean up in severe conditions. The Commercial BRUTUS units are equipped with varying attachments including a bucket, grapple and pallet fork which allows the vehicles to be used for multiple purposes. BRUTUS’ Pro-TachTM system makes it quick and easy to change attachments allowing the vehicle to complete multiple tasks (mow, sweep, scoop, blow, lift), minimize downtime and reduce the amount of vehicles needed on site. One BRUTUS also is equipped with TERRAINARMOR NPT tires, which are built to never go flat and are virtually indestructible. The Military RANGER HIPPO has an integrated Power system that is driven by the vehicle’s diesel engine. This allows the vehicle to travel to sites with no available power sources and run a variety of hydraulic, pneumatic, electric, and welding equipment, eliminating the need for generators and other bulky equipment usually needed for these jobs. The Polaris® M1400 unit is a 2x4 gas-powered, commercial utility vehicle, capable of hauling 1,400 pounds and towing 1,500 pounds. The vehicle delivers more power and payload on its integrated metal bed than other vehicles in its class delivering maximum efficiency. The donated vehicles will be put in to immediate use as they are being shipped directly from Polaris to Philadelphia to distribute meals to the volunteers in support of the Pope’s visit. The Salvation Army is an international organization represented in 126 countries. Its largest outreach is in the United States serving nearly 30 million people each year. One of its most public services is to survivors of disaster and has become well known for being one of the first agencies to arrive and last to leave at the scene of devastation. The mission to love those in the name of Christ and serve those suffering at times of crisis has placed The Salvation Army in some of the most challenged communities in the world to offer hope and care to those with no place else to turn. Learn more at SalvationArmyNorth.org.